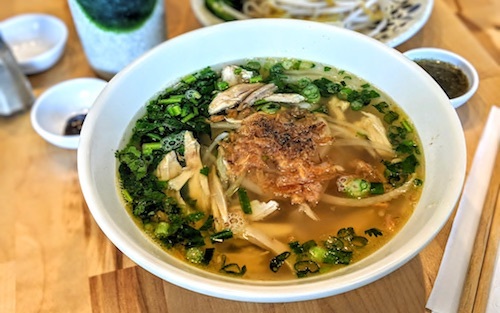 Without much fanfare, this Bensonhurst address quietly changed from a Chinese breakfast spot called "KooKoo Cafe" to Em, which opened its doors two and a half months ago. 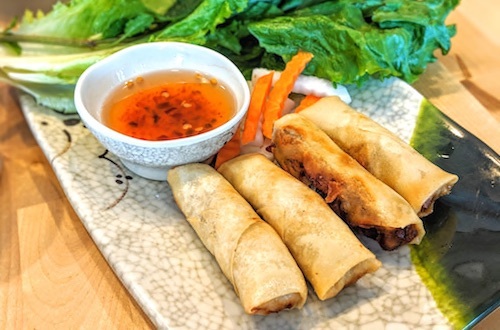 After reading through the love story on the restaurant's website and seeing that the chef only recently moved here to New York City from southern Vietnam, a quick trip to Bensonhurst was in order. Vietnamese restaurants in this city must be approached with caution, but first reports here are good. The quickest thing you notice is the much higher level quality of ingredients used in every dish, from the cuts of meat to the freshness of the vegetables. From what I can discern, "em" means "younger sibling," and this chef obviously learned a lot from her family. There is care in the preparation, and the menu is very small. 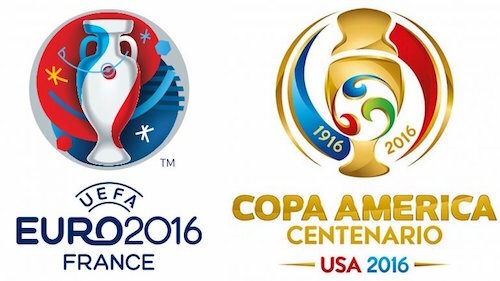 This focus is admirable, as many restaurants will list 20 pho options and do them all poorly. Fresh off a recent Los Angeles trip to possibly the most famous nem nuong house in the country, a sample of the nem nuong cuon ($6, above and below) seemed necessary. The bites are fresh and nice, the grilled pork does not disappoint. Something about the bowl of hu tieu ($8.50, below) shows its hand even before eating, as if to say "You are going to like this better than any other version in town." And the talking soup was not wrong. This is the restaurant and chef's signature dish, and full of complexity and warmth. Squirting and spooning in extra sauces, chilis, and sugars is completely unnecessary, the broth is perfect as it comes out. Our server kept mentioning it was MSG-free, so if that concerns you, the bowl has that going for it as well. The hu tieu speaks to you. If you prefer a little kick, just add the jalapeños to infuse the broth rather than changing the flavor profile with sriracha. Online they had only listed one pho, the house pho ga, but a new beef option was available that will become permanent on the menu. The pho bo ($12, below) was unfortunately the only item that was a bit lacking. All the signs of a good bowl are there, but it might just need a little more work with the broth. The beef cuts are really good and the potential is high. Maybe another couple months will make this soup ready for primetime. The menu is also populated by four banh mi options, of which the banh mi Em ($6.50, below) is shown. 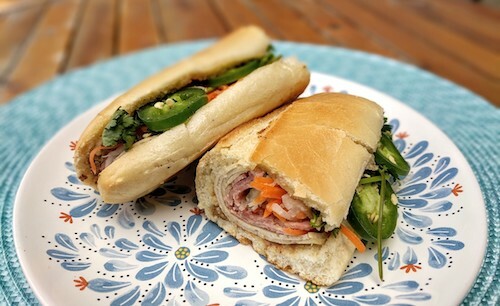 This is their rendition of the classic banh mi, with layers of pork, pate, and fresh vegetables. 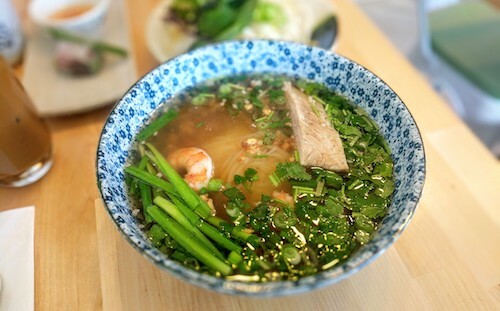 In the near future, the restaurant is planning to offer a fish noodle soup that has its origin in the chef's home province of Khanh Hoa, Vietnam. 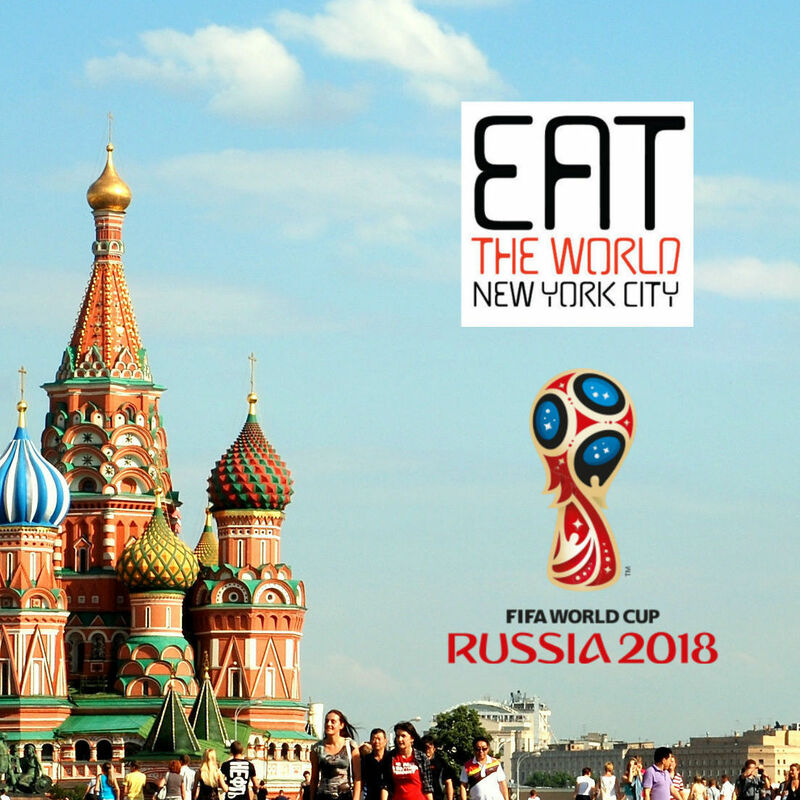 This unique dish is probably something that our city has not had the opportunity to eat, and is much anticipated. 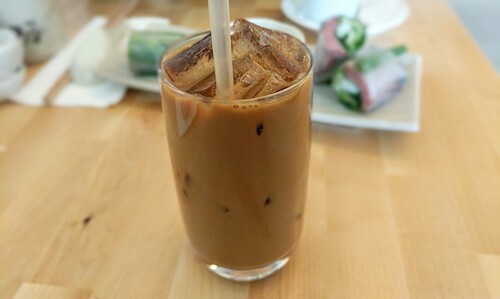 The tasty Vietnamese-style iced coffee ($3, below) got a discussion going about third generation Southeast Asian restaurants. Thai restaurants, especially in Queens, are currently thriving under the leadership of this "third generation," who are taking bigger risks and preparing the foods how they are meant to be rather than catered to western tastes. 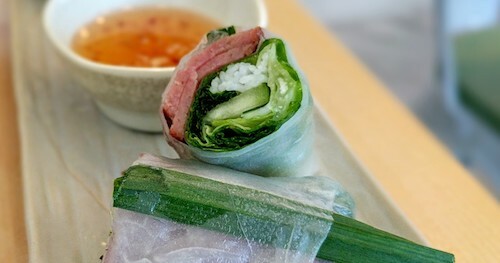 Vietnamese food is a bit different, but the current generation in New York right now is not as concerned with freshness and quality that make the cuisine so delicate and extraordinary. This coffee was of higher grade, and a touch less sweet than most, setting some of these ideas in motion. Maybe it was all in my head, but maybe this "third generation" is soon to flourish in New York City. We can only hope. If coffee is not your thing, a full range of smoothies is available and will be very tempting in warmer months. The chef's husband is in the business of exotic fruit importing, and these promise to be satisfying. Along with nearby Pho 18 Ave and Little Saigon Pearl, this is one of the three most important Vietnamese restaurants in the city. There is still a lot of room for improvement, but Bensonhurst is ground zero at the moment. 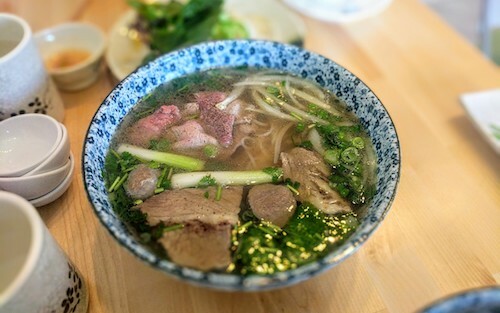 We were finally able to return and have that pho ga (below) and really enjoyed it. Once again the broth is good as it comes out but they also serve a small bowl of sauce specifically for it. It adds complexity and depth, but its bitterness might not be for all. The noodles they use for this and the hu tieu are excellent.